So please explore our website to see examples of our work and product base and if you would like to have a question answered please feel free to contact us. This is an example of Clinker Cleaner AC being usud on Brick to clean cement off the bottom brick and carbon off the top brick. As you can see the cement on the bottom right brick has completely ruined the bricks aesthetics, the same thing can be said about the brick on the top right that has carbon build up. For a personal experience we tried the clinker cleaner on the bricks to see how well it would take off the build up on the bricks in one coat and the results are shown above. 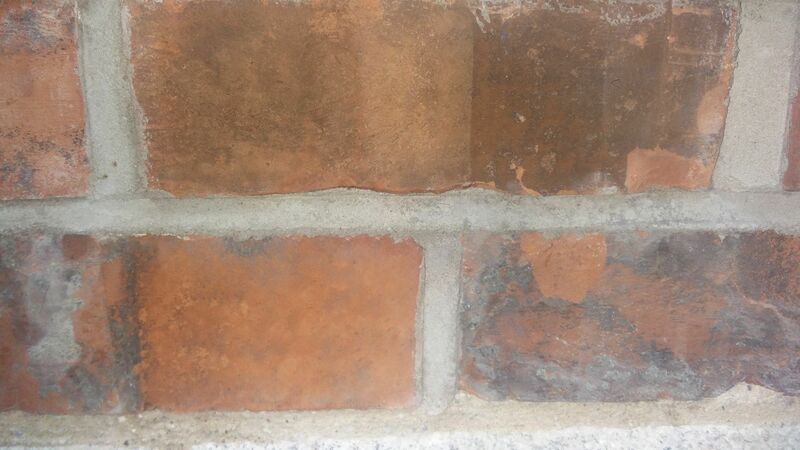 The above picture shows Funcosil Facade Cream in action repelling water from the protected brick on the left. The brick on the right was also sprayed with water and it is shown absorbing the water and holding it which is bad and can cause rising damp, frost damage in the winter months and algae growth.The water repellent prevents all water from entering the brick thus preventing harmful outcomes listed prior allowing you to go on without having to worry about your having to repair the bricks.